Filters are the Rodney Dangerfield of photographic gear: They don’t get enough respect. Most photographers will begin to salivate when talking about the latest camera bodies or lenses and even plates or heads for our tripods, but we tend to think of filters as pedestrian items, if we think about them at all. I nearly always make room in my bag for several filters, and I believe that using them properly is more important than what camera or even which lens I choose. Let’s look into why these affordable little accessories are so important. Three kinds of filters are essential gear for most photographers. I’ll cover each type here. Note that you must use a filter that is the correct size to attach to your lens. It’s a good idea to keep a UV filter (also known as a haze filter) attached to your lenses at all times, as this helps protect the front element of the lens from fingerprints, moisture, and even scratches. In addition to offering some physical protection for your lens, a good UV filter can also improve image quality when there is atmospheric haze or moisture in the air. Use a good quality filter, though, as some can adversely affect your image quality. I would recommend removing the UV filter when shooting with certain other combinations of filters, as the edges of the image can be cut off (vignetting) with too thick a stack of filters on the end of the lens. In most cases, use of a UV filter does not affect the exposure more than about half a stop, so they can be used in most lighting conditions. I’ve had good luck with Hoya UV filters. Always be sure to look at the specifications for your lens before buying any screw-on filter, because the diameter of the filter thread must match the size of the lens. The second must-have type of filter is the circular polarizer. A polarizing filter can reduce glaring reflections and can darken skies and enhance natural colors. This little gadget is almost a secret weapon for making images that really pop. Again, I like the Hoya products, which are thin, well made, and perform as they should. It takes a bit of practice to learn to use a polarizing filter properly. While looking through your camera’s viewfinder or LCD screen, turn the outer part of the filter slowly to see the effect. The greater the angle between the light source (typically the sun) and the shooting direction, the bigger the effect of turning the outer ring of the filter. You will observe as you rotate the outer ring of the filter that the sky, clouds, and any bodies of water will transform quite dramatically. When you see the effect you like best, overshoot a little bit and then rotate the outer ring back to where you want it. In most cases, I recommend not using the maximum amount of polarizing effect when there are reflections from water or glass, because you usually want some of these reflections to be visible in your final image, but this is art, not science, so you get to choose the effect you want. Note that using a polarizing filter will cost you about 2-3 stops of exposure. You will have to use a slower shutter speed and/or faster ISO or wider aperture, so use a steady tripod if the lighting conditions are dim. Here’s an example of a shooting situation in which a polarizing filter can really make an image pop. 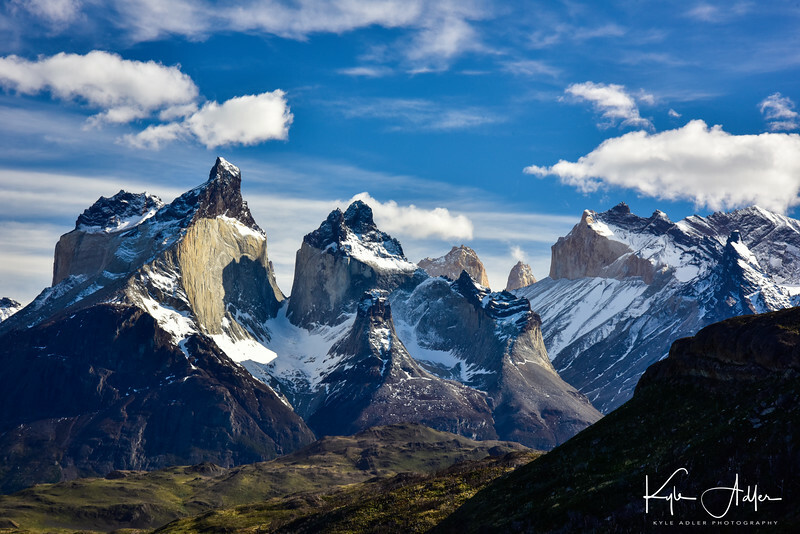 For this shot of the imposing peaks in Southern Patagonia’s Torres del Paine National Park, I rotated the polarizer to about 2/3 of its maximum effect to darken the sky, make the clouds more dramatic, and bring out the bright sheer faces of the granite peaks. The final essential filter is the neutral density (ND) filter. These reduce the amount of light that reaches the camera’s sensor, so you can use slower shutter speeds to blur motion, or so you can use a wider aperture to get a shallow depth-of-field, even in bright sunlight. ND filters come in different strengths as designated by the number in the filter’s specifications. For example, an ND2 filter blocks 1/2 the light for a one-stop reduction in exposure, while an ND8 filter blocks 7/8 of the light for a three-stop reduction in exposure. It’s a good idea to carry a range of ND filters for each lens you plan to use in the field. A newer type of ND filter even allows for variable adjustment of the strength of the ND effect with just one filter, but these tend to be expensive. A classic example of a situation in which you’d want to use an ND filter is when shooting moving water in bright lighting conditions. You may want to use a longer shutter speed to blur the water, but even at your camera’s lowest ISO setting and your lens’ smallest aperture there could still be too much light for a slow shutter speed. Mounting an ND8 filter to your lens will allow you to use a shutter speed eight times longer than without the filter, so for example you could move from shooting at 1/30 of a second to 1/4 of a second. 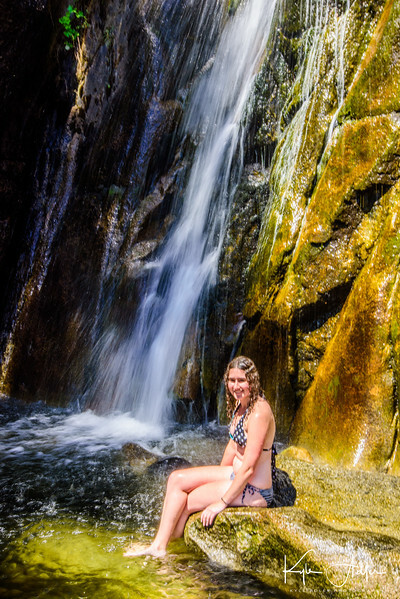 Here’s a photo of my younger daughter by a waterfall in Yosemite National Park. The image was made in the early afternoon under very bright sunlight, bright enough that even using my camera’s slowest native ISO sensitivity and my lens’s most narrow aperture, I would still have had to use a shutter speed of 1/60 of a second, which would have frozen the water in the falls. Using an ND8 filter, however, I was able to slow down the shutter speed to 1/8 of a second, long enough to impart a nice blur to the falling water. I recommend carrying a kit containing several ND filters of different strengths for each lens you plan to use for landscape images. Once again, make sure the diameter of the filter matches the diameter of the lens you intend to fit it to. Note that there’s another type of ND filter called the “graduated ND filter,” and this filter varies the light-blocking effect from one end of the filter to the other end. I used to use this type of filter quite often, but in this digital era I find it usually works just as well to simulate the effect of a graduated ND filter using post-processing software later. Armed with these three types of filters, you will be prepared to create the images you have in your mind, even under challenging shooting conditions. Happily, filters are small, light, and not terribly expensive, making them one of the better values we photographers can find. Which filters do you always carry, and when have you found them most useful? Any tips or tricks on how to use filters for the best results? Please leave a comment in the box after this post to share your thoughts. Want to see more posts about photography gear? Find them all here: Posts on Gear.